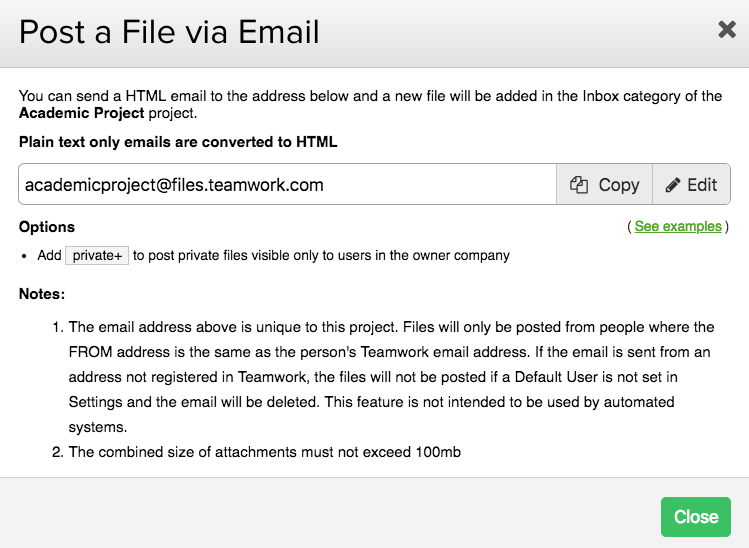 Within Teamwork Projects, you can post files directly to your project via email. Go to the Files area of your project. Click the options (three dots) button in the top right corner, and select Post a File via Email from the dropdown menu. In the post via email modal, you will see the email address for sending files via email. Click copy to copy the email to the clipboard. Note: There is a combined file limit of 100MB per email. If you have images from another email you want to send to your Teamwork account, save all the images to your desktop and then attach them to a new email which can then be sent to your files-by-email Teamwork address. You can append private+ to the email address to make the files private. You can specify which category to add the file to. In the subject line add [#My Category]. If the category already exists, we use it; if not, we create a new category.